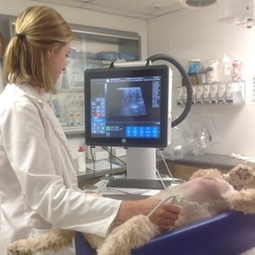 Ultrasound - Veterinary Medical Ctr of Lebanon, Inc.
We now have team members certified in ultrasonography. Ultrasound is used to evaluate the appearance of internal organs such as the stomach, intestines, liver, spleen, kidneys and bladder for any abnormalities. It is noninvasive and we try to perform the procedure while your pet is awake to avoid unnecessary sedation. Your pet will need to have the belly shaved for better images. We also prefer to fast your pet overnite for the procedure to minimize gas in the stomach and intestines which can affect image quality. We may send the ultrasound images to a specialist to review if there are concerns.